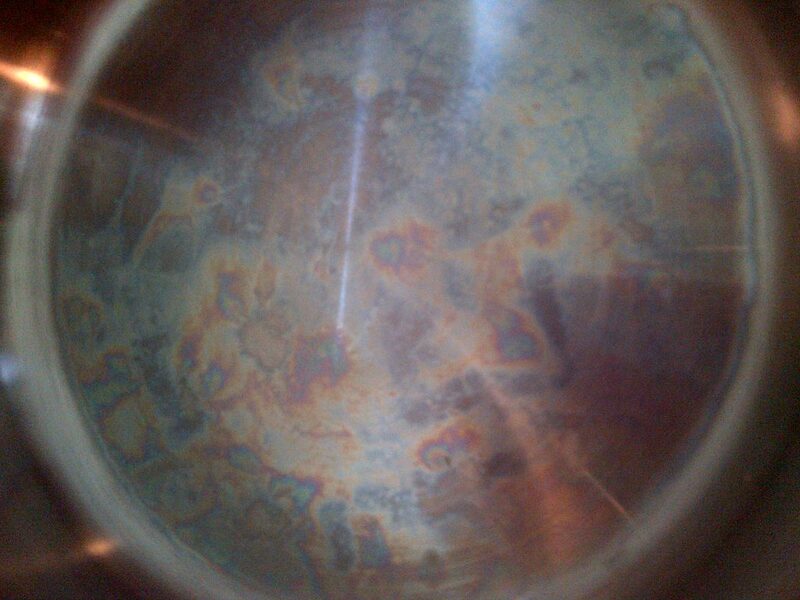 If you’ve ever overheated your stainless steel cookware (like almost all Revere Ware) you’ve seen that rainbow tint discoloration that stainless steel can take on. This isn’t something you can simply wash off. This discoloration is called heat tint. Stainless steel works (keep from rusting) due to the addition of small amount of chromium int the steel mixture. (Note that this is a type of chromium that the body needs in trace amounts, not the hexavalent chromium of the type featured in the move Erin Brockovich.) The Chromium oxidizes and forms a thin layout on the outside of the stainless steel which keeps the iron from rusting. The nice thing about stainless steel is that this layer is self repairing; if you damage it, more chromium is exposed to air and oxidizes to form a new protective layer. However, it seems that under high heat, parts of the stainless steel can form a thicker chrome oxide layer. Chrome oxide layers of different thicknesses will show different colors. In short, the rainbow tint is completely harmless, if not annoying. The best suggestion we’ve seen to remove it is to use a stainless steel cleaner like Bar Keepers Friend to polish the outside of the cookware.